It does the job, lasts ages and represents excellent value for money. What's not to like? Great value. Excellent results in our tests. 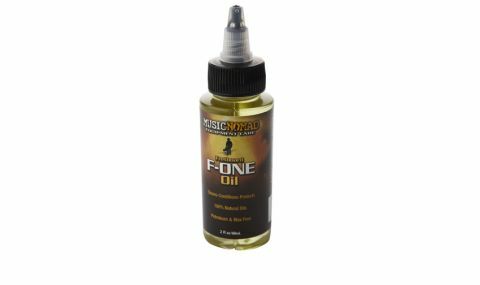 Every now and then, you'll want to give your guitar's fretboard a clean to keep it playing smoothly - MusicNomad's Fretboard F-One Oil is one option for a dirt-free 'board. "It can make your guitar smell like a garden centre, but F-One Oil cleans and protects your 'board"
It avoids commonly used 'lemon' oil and works on all unfinished rosewood, ebony and maple fretboards. Although its mixture of ultra-refined tree and seed oils can make your guitar smell like a garden centre up close, F-One Oil cleans and protects your 'board. It certainly brought silky playability back to the guitars we tested it on, and since you only need to use a tiny bit each time, one bottle will last ages, too.